ATHENS ACROPOLIS MUSEUM Relief of the "Mourning Athena"
Relief of the "Mourning Athena". 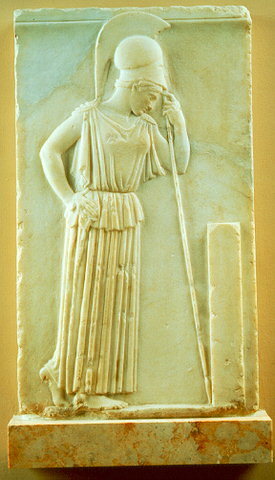 The goddess is clad in an Attic peplos with a belt and slightly bends her head towards the stele depicted in front of her. Dated to ca. 460 B.C. Inv. no. 695.